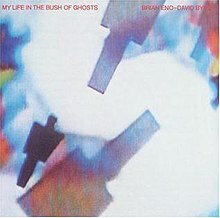 My Life in the Bush of Ghosts is the first collaborative album by Brian Eno and David Byrne, released in February 1981. It integrates sampled vocals and found sounds, African and Middle Eastern rhythms, and electronic music techniques. It was recorded prior to Eno and Byrne's work on Talking Heads' album Remain in Light (1980), but sample clearance problems delayed its release by several months. The extensive use of sampling is considered innovative, though its influence on later sample-based music genres is debated. Pitchfork listed it as the 21st best album of the 1980s, while Slant Magazine listed the album at No. 83 on its list of the "Best Albums of 1980s". Eno and Byrne first worked together on More Songs About Buildings and Food, the 1978 album by Byrne's band Talking Heads. My Life was primarily recorded during a break between the Talking Heads albums Fear of Music (1979) and Remain in Light (1980), both of which Eno worked on. Eno described the album as a "vision of a psychedelic Africa". Rather than conventional pop or rock singing, most of the vocals are sampled from other sources, such as commercial recordings of Arabic singers, radio disc jockeys, and an exorcist. Musicians had previously used similar sampling techniques, but according to Dave Simpson, it had never before been used "to such cataclysmic effect" as on My Life. In 2001, Eno denied that he and Byrne had invented sampling, citing Holger Czukay's experiments with dictaphones and short-wave radios as earlier examples. He felt that the "difference was, I suppose, that I decided to make [sampling] the lead vocal". The release was delayed while legal rights were sought for the large number of samples used in the album. The album title is derived from Amos Tutuola's 1954 novel My Life in the Bush of Ghosts. 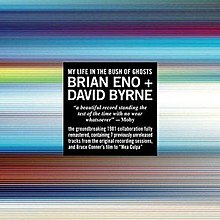 According to Byrne’s 2006 sleeve notes, neither he nor Eno had read the novel, but felt the title "seemed to encapsulate what this record was about". Notes below indicated the voices sampled, from the liner notes. "America Is Waiting" – Ray Taliaferro of KGO NEWSTALK AM 810, San Francisco, April 1980. "Mea Culpa" – Inflamed caller and smooth politician replying, both unidentified. Radio call-in show, New York, July 1979. "Help Me Somebody" – Reverend Paul Morton, broadcast sermon, New Orleans, June 1980. "The Jezebel Spirit" – Unidentified exorcist, New York, September 1980. "Moonlight in Glory" – The Moving Star Hall Singers, Sea Island, Georgia. (From The Moving Star Hall Singers, Folkways FS 3841), produced by Guy Carawan. The original package design was created by Peter Saville. The cover image was created by pasting small cutout humanoid shapes onto a monitor and pointing a camera at it to create video feedback, infinitely multiplying the shapes: "Somehow, despite it being very techie, these techniques also seemed analogous to what we were doing on the record. It was funky as well as being techie. Extremely lo-tech, actually, and not what you were supposed to do with a TV set." In Rolling Stone, Jon Pareles applauded My Life in the Bush of Ghosts as "an undeniably awesome feat of tape editing and rhythmic ingenuity" that generally avoids "exoticism or cuteness" by "complementing the [speech] sources without absorbing them". Village Voice critic Robert Christgau was less impressed, finding the recordings "as cluttered and undistinguished as the MOR fusion and prog-rock it brings to the mind's ear", while lacking "the songful sweep of Remain in Light or the austere weirdness of Jon Hassell". AllMusic critic John Bush describes it as a "pioneering work for countless styles connected to electronics, ambience and Third World music". In a 1985 interview, singer Kate Bush said that Bush of Ghosts "left a very big mark on popular music". Pink Floyd keyboardist Rick Wright said it "knocked me sideways when I first heard it – full of drum loops, samples and soundscapes. Stuff that we really take for granted now, but which was unheard of in all but the most progressive musical circles at the time... The way the sounds were mixed in was so fresh, it was amazing." The album was reissued on March 27, 2006 in the UK and April 11, 2006 in the US, remastered and with seven extra tracks. To mark the reissue, two songs were made available to download, consisting of the entire multitracks. Under the Creative Commons License, members of the public are able to download the multitracks, and use them for their own remixes. All music composed by Brian Eno and David Byrne, except "Regiment" by Eno, Byrne, and Michael "Busta Cherry" Jones. In the 1982 second edition, the track "Qu'ran"—which features samples of Qur'anic recital—was removed at the request of the Islamic Council of Great Britain. In its place "Very, Very Hungry" (the B-side of "The Jezebel Spirit" 12" EP) was substituted. The first edition of the CD (1986) included both tracks, with "Very, Very Hungry" as a bonus track. Later editions (1990 and later) followed the revised LP track order without "Qu'ran." A widely circulated bootleg of outtakes was released in 1992 as Klondyke Records KR 21. Sound quality is nearly equal to the original CD release. Except as noted, the tracks are the same mix as originally released. Remastered, with bonus tracks. 2, 3, 7 and 8 are longer than on the original album. John Cooksey – drums on "Help Me Somebody" and "Qu'ran"
Chris Frantz – drums on "Regiment"
Robert Fripp – Frippertronics on "Regiment"
Michael "Busta Cherry" Jones – bass guitar on "Regiment"
Dennis Keeley – bodhrán on "Mea Culpa"
Bill Laswell – bass guitar on "America Is Waiting"
Mingo Lewis – batá, sticks on "The Jezebel Spirit" and "The Carrier"
Prairie Prince – can, bass drum on "The Jezebel Spirit" and "The Carrier"
José Rossy – congas, agong-gong on "Moonlight in Glory"
Steve Scales – congas, metals on "Help Me Somebody"
David Van Tieghem – drums, percussion (scrap metal, found objects) on "America Is Waiting" and "Regiment"
Tim Wright – click bass on "America Is Waiting"
^ Bob W., White (2012). Music and Globalization: Critical Encounters. Bloomingtom: Indiana University Press. ISBN 978-0-253-35712-0. ^ Ciabattoni, Steve (April 28, 2003). "CMJ Silver Salute". CMJ New Music Report. 75 (811). Retrieved 5 March 2017. ^ a b c d Bush, John. "My Life in the Bush of Ghosts – Brian Eno / David Byrne". AllMusic. Retrieved 15 June 2011. ^ a b Bogdanov, Vladimir et. al. All Music Guide to Rock: The Definitive Guide to Rock, Pop, and Soul. Hal Leonard Corporation, 2002. P. 368. ^ Segal, Dave. "Record Review: Brian Eno Couldn't Have Made a Better Farewell Album Than The Ship (Whether It's a Farewell or Not)". The Stranger. Retrieved 16 June 2018. ^ "Best Albums of the 1980s". Slant Magazine. Retrieved 2012-03-25. ^ "Sounds: The Life of Brian in the Bush of Ghosts". music.hyperreal.org. Retrieved 2018-10-12. ^ Simpson, Dave (24 March 2006). "CD: Brian Eno and David Byrne, My Life in the Bush of Ghosts" – via www.theguardian.com. ^ Sheppard, David (July 2001). "Cash for Questions". Q. ^ a b Dahlen, Chris (2006-07-17). "Interviews: David Byrne". Pitchfork Media. ^ "My Life In The Bush Of Ghosts - Encylotronic.com". Retrieved 26 September 2017. ^ a b Pareles, Jon (2 April 1981). "My Life In The Bush Of Ghosts". Rolling Stone. Retrieved 15 June 2011. ^ Considine, J. D. (1992). "Brian Eno". In DeCurtis, Anthony; Henke, James; George-Warren, Holly (eds.). The Rolling Stone Album Guide (3rd ed.). Random House. p. 228. ISBN 0679737294. ^ Weisbard, Eric; Marks, Craig, eds. (1995). "Brian Eno". Spin Alternative Record Guide. New York: Vintage Books. ISBN 0-679-75574-8. ^ a b Christgau, Robert (4 May 1981). "Christgau's Consumer Guide". The Village Voice. New York. Retrieved 15 June 2011. ^ "David Byrne and Brian Eno: My Life in the Bush of Ghosts". Blender (46): 123. April 2006. ^ Nashawaty, Chris (7 April 2006). "My Life in the Bush of Ghosts". Entertainment Weekly. Retrieved 15 June 2011. ^ Simpson, Dave (24 March 2006). "Brian Eno and David Byrne, My Life in the Bush of Ghosts". The Guardian. London. Retrieved 25 March 2012. ^ Gill, Andy (24 March 2006). "Album: Brian Eno & David Byrne". The Independent. London. ^ "David Byrne and Brian Eno: My Life in the Bush of Ghosts". Mojo (150): 122. May 2006. ^ Cowley, Jason (19 March 2006). "Reissue of the month: Brian Eno and David Byrne, My Life In the Bush of Ghosts". The Observer. London. Retrieved 25 March 2012. ^ Dahlen, Chris (23 March 2006). "David Byrne & Brian Eno: My Life in the Bush of Ghosts". Pitchfork. Retrieved 30 April 2012. ^ "David Byrne and Brian Eno: My Life in the Bush of Ghosts". Q (238): 137. May 2006. ^ "David Byrne and Brian Eno: My Life in the Bush of Ghosts". Uncut (107): 119. April 2006. ^ "Gaffaweb - Kate Bush - REACHING OUT - MTV - Unedited". gaffa.org. ^ "EnoWeb: The Latest Brian Eno News and Information". music.hyperreal.org. ^ "Robert Fripp, 20th of December 1979 at Blue Rock Studios". Discipline Global Mobile. ^ "charts.org.nz – Brian Eno & David Byrne – My Life in the Bush of Ghosts". Recording Industry Association of New Zealand. Retrieved 2010-07-08. ^ "ultratop.be – Brian Eno & David Byrne – My Life in the Bush of Ghosts". Ultratop. Retrieved 2010-07-08. Transcriptions, and possible alternatives, of the "lyrics"
Music for "The Knee Plays"
This page was last edited on 9 March 2019, at 06:51 (UTC).